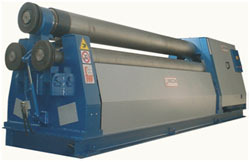 FACCIN SRL - DESIGNING, MANUFACTURING AND SELLING PLATE BENDING ROLLS, SECTION BENDING ROLLS, DISHING AND FLANGING. FACCIN MACHINES is considered to be the most technologically advanced bending rolls for plate and profiles available today, Worldwide. The world largest factory dedicated to the construction of bending rolls. This includes Design, Fabrication, Machining and Assembly. Total Quality, Product Reliability and Efficiency in the after sale services are kept under control trough a stable and knowledgeable team of experts. This is why FACCIN is considered a serious and reliable partner for the present and for the future. Their list consists of machines for PLATE ROLLS, ANGLE ROLLS, DISHED HEADS. 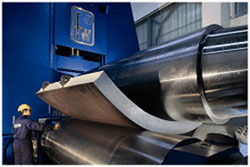 Angle rolls are expressly designed for rolling profiles with high resistance to the bending. This is the reason why the structures are heavily dimensioned and are built with heavy thickness plates of certified quality steel. They are Electro-welded and heat treated to release the internal stresses. The solidity of the structure is in fact an essential parameter to guarantee reliability and precision trough the years. 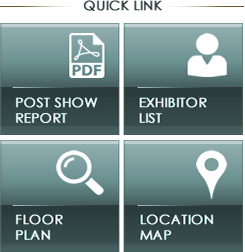 The integration of, design of customised applications to the after sales support, through a network of sales and technical centres specialising only in bending rolls offers the most complete and highest standard of service, resulting in FACCIN being the ideal partner to solve any bending roll requirement and the supplier to choose for the third millennium.